Jason Kukla, left, and Darin Antoine of Dan Brady Painting and Wood Restoration prime the exterior of Reynolds-Jonkhoff Funeral Home in Traverse City in preparation for a paint. 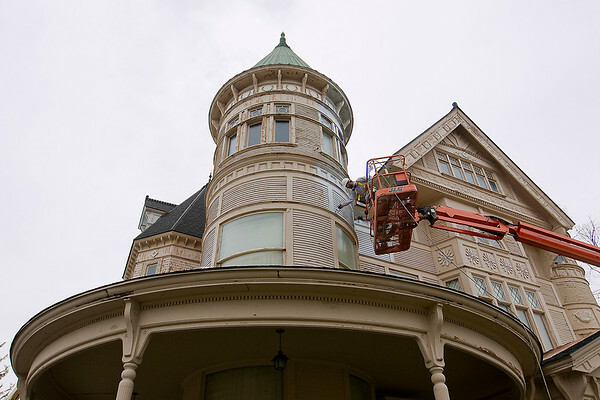 The historic home of Perry Hannah sits at the corner of Sixth and Pine Streets in Traverse City's Central Neighborhood, and is getting its first full coat of paint in 20 years. The project is expected to use over 80 gallons of primer and about 80 to 100 gallons of paint on the three story, 14,000 square foot structure.